The Plateau subarea has highly diverse housing including this one in the Briar community. The area is also of interest to FCUAC because it represents a potential buffer area between the rural areas of Four Creeks and the urban areas of Renton. The plateau is also a major watershed into both May Valley and the Cedar River. Briar: A residential area built in the late-70’s and early 80’s, the area has a great diversity of homes set on heavily wooded 1/4 to 1/3 acre lots. 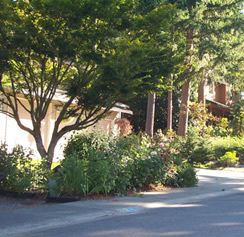 Partially because of urgings from FCUAC, Renton decided in the Fall of 2006 to create a task force of citizens from the Potential Annexation Area on the east Renton plateau. The purpose of the task force is to give direct citizen input to the planning department in Renton and to Renton’s Planning Commission.